Surface Pro was released and sold out a week ago and the main question for this report would be if the problem was a result of great demand or just a supply bottleneck. Read on to find out what our data shows, but first a couple of words about the data itself. 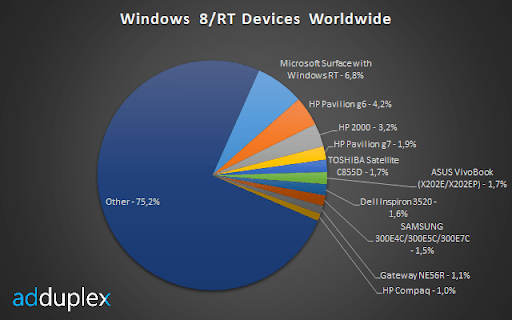 This report is based on the usage data collected from 132 Windows Store apps running AdDuplex SDK over the period of one day of February 15th, 2013. We’ve made a reasonable effort to aggregate data for different reported names for the same models and/or manufacturers but with more than 7,000 different devices detected it’s obvious that some of these variations slipped through. Let’s start by covering top devices worldwide. Not much has changed over the month. 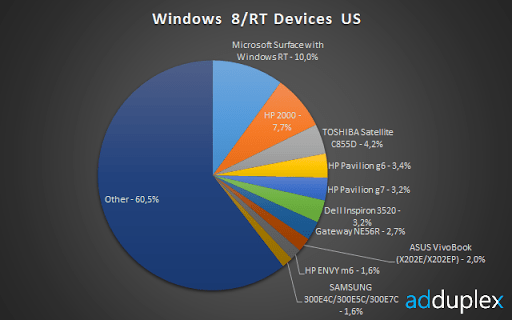 A few noticeable changes are Surface RT share shrinking a little, ASUS VivoTab RT dropping out of Top 10 and VivoBook growing ~1.5x. 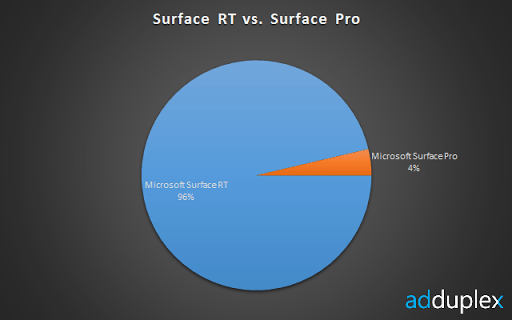 So according to our data it looks like limited supply was the reason of Surface Pro selling out really quickly. Almost nothing has changed here with only some slight shuffling of places without significant effect on the market share. Again no major changes in device share in US. Surface RT lost some ground but otherwise not much has changed. 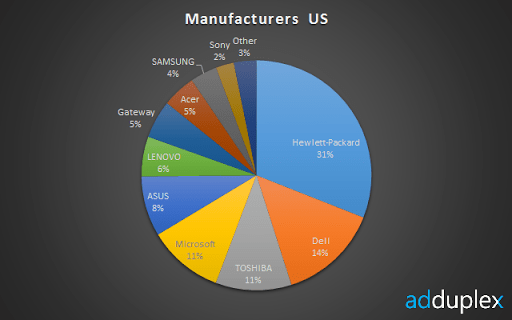 Microsoft has slipped to number 4 (was 3) in otherwise static manufacturer chart. 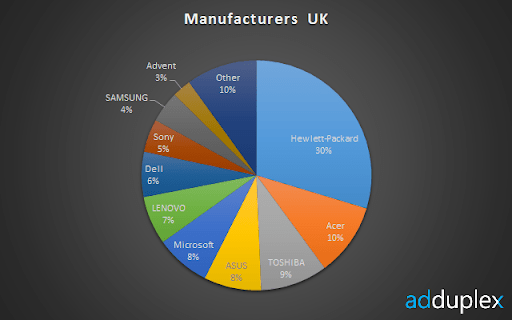 HP is number 1 in UK as well, but Dell is only 7th, behind Acer, Toshiba, Asus, Microsoft and Lenovo. Advent (a local brand) sits at #10 with 3%. 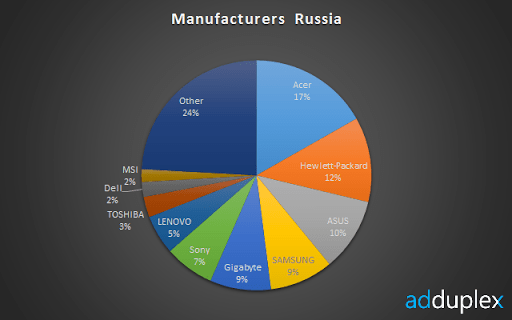 Acer rules in Russia with HP at the second position. A notable stat is that Other slice is much bigger in Russia than in other places we’ve covered today. Most of it is comprised of small local(?) 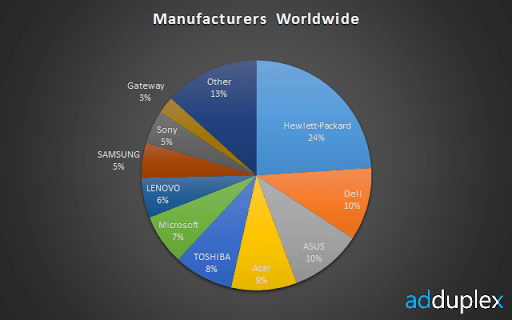 brands and self-assembled PCs. 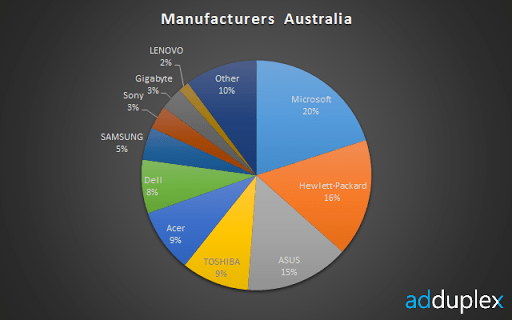 And finally, Australia – the only country (today) where the top spot belongs to Microsoft. That’s it for this report. We will see how Surface Pro and hopefully other new models are doing next month.